Posted on February 3rd, 2008 by StuFF mc. 1) Why do I have twice httpd under _www + another one with root? 3) Why the biggest spanish TV channel did not choose the right partner for their streaming software? 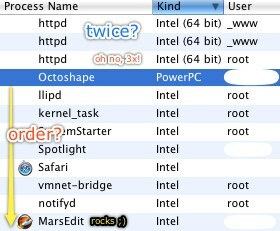 Octoshape (nope, no link for both of you bad bad guys), not working with Leopard. 4) How the hell is the rest (being all “Intel”) sorted?!? Not with the user, not the name, as you can see… Not the PID, not the RM, not the VM, trust me! Maybe an other column? Comment on February 3rd, 2008.